خورشیدی, کوروش, فلاح, ابوالفضل, سیاه پوش, علی. (1396). تحلیل ارتعاش آزاد نانو ورق مرکب مستطیلی هدفمند با استفاده از تئوری غیر محلی نمایی تغییر شکل برشی دریک محیط حرارتی. علوم و فناوری کامپوزیت, 4(1), 109-120. کوروش خورشیدی; ابوالفضل فلاح; علی سیاه پوش. "تحلیل ارتعاش آزاد نانو ورق مرکب مستطیلی هدفمند با استفاده از تئوری غیر محلی نمایی تغییر شکل برشی دریک محیط حرارتی". علوم و فناوری کامپوزیت, 4, 1, 1396, 109-120. خورشیدی, کوروش, فلاح, ابوالفضل, سیاه پوش, علی. (1396). 'تحلیل ارتعاش آزاد نانو ورق مرکب مستطیلی هدفمند با استفاده از تئوری غیر محلی نمایی تغییر شکل برشی دریک محیط حرارتی', علوم و فناوری کامپوزیت, 4(1), pp. 109-120. خورشیدی, کوروش, فلاح, ابوالفضل, سیاه پوش, علی. تحلیل ارتعاش آزاد نانو ورق مرکب مستطیلی هدفمند با استفاده از تئوری غیر محلی نمایی تغییر شکل برشی دریک محیط حرارتی. علوم و فناوری کامپوزیت, 1396; 4(1): 109-120. در این مقاله تحلیل ارتعاش آزاد نانو ورق مرکب مستطیلی تابعی هدفمند در محیط حرارتی بررسی شده است. برای به‌دست آوردن فرکانس طبیعی نانو ورق مرکب از تئوری الاستیسیته‌ی غیر محلی بر پایه‌ی تئوری تغییر شکل برشی نمایی استفاده شده است. در تئوری تغییر شکل برشی نمایی، تابع نمایی در راستای ضخامت، برای در نظر گرفتن تاثیرات تغییر شکل برشی عرضی و اینرسی دورانی به‌کار می‌رود. از تئوری الاستیسیته غیر محلی جهت در نظر گرفتن پارامتر مقیاس طول کوچک نانو ورق تابعی هدفمند استفاده شده است. حرارت در سطوح ورق ثابت در نظر گرفته شده است. خواص مواد وابسته به دما و در راستای ضخامت بر اساس قانون توزیع توانی تغییر می‌کند. معادلات حرکت با بکارگیری اصل همیلتون به‌دست می‌آیند. به‌منظور اعتبار سنجی روش حاضر مقایسه‌ای بین نتایج حاصله و نتایج سایر مقالات در دسترس انجام می‌شود. در نهایت تاثیر پارامترهای مختلف از قبیل پارامتر غیر محلی، ضریب نسبت حجمی توانی، نسبت عرض به طول، نرخ ضخامت به طول و دماهای سطح مختلف بر نانو ورق مستطیلی تابعی هدفمند در محیط حرارتی ارایه شده و جزییات مورد بحث قرار گرفته‌اند. In the present study the free vibration analysis of functionally graded composite rectangular nanoplates in thermal environment is investigated. The nonlocal elasticity theory based on the exponential shear deformation theory has been used to obtain the natural frequencies of the nanoplate. In exponential shear deformation theory an exponential functions are used in terms of thickness coordinate to include the effect of transverse shear deformation and rotary inertia. Nonlocal elasticity theory is employed to investigate effect of small scale on natural frequency of the functionally graded rectangular nanoplate. The temperature is assumed to be constant in the plane of the plate and to vary in the thickness direction only. Material properties are assumed to be temperature dependent, and vary continuously through the thickness according to a power law distribution in terms of the volume fraction of the constituents. The govering equations are derived by implementing Hamilton’s principle. To show the accuracy of the formulations, present result’s in specific cases are compared with available results in literature and good agreement are seen. Finally, the effect of various parameters such as nonlocal parameter, power law indexes, width to length ratio, the thickness to length ratio, and temperature fields on the natural frequencies of rectangular FG nanoplates are presented and discussed in detail. Khorshidi, K., “Effect of Hydrostatic Pressure and Depth of Fluid on the Vibrating Rectangular Plates Partially in Contact with Fluid”, Applied Mechanics and Materials, Vol. 110, pp. 927-935, 2011. Khorshidi, K. and Farhadi, S., “Free Vibration Analysis Of A Laminated Composite Rectangular Plate In Contact With A Bounded Fluid”, Composite structures, Vol. 104, No.45, pp. 176-186, 2013. Dozio, L., “On The Use Of The Trigonometric Ritz Method For General Vibration Analysis Of Rectangular Kirchhoff Plates”, Thin-Walled Structures, Vol. 49, No. 1, pp. 129-144, 2011. Mantari, J.L. and Soares, C.G., “A Trigonometric Plate Theory With Unknowns And Stretching Effect For Advanced Composite Plates”, Composite Structures, Vol. 107, No. 5, pp. 396-405, 2014. Tounsi, A. Houari, M.S.A. Benyoucef, S. and Bedia, E.A. A., “A Refined Trigonometric Shear Deformation Theory For Thermoelastic Bending Of Functionally Graded Sandwich Plates”, Aerospace science and technology, Vol. 24, No. 1, pp. 209-220, 2013. Sayyad, A.S. and Ghugal, Y.M., “Bending And Free Vibration Analysis Of Thick Isotropic Plates By Using Exponential Shear Deformation Theory”, Applied and Computational mechanics, Vol. 100, No. 2, pp. 290-299, 2012. Kharde, S.B. Mahale, A.K. Bhosale, K.C. and Thorat, S.R., “Flexural Vibration Of Thick Isotropic Plates By Using Exponential Shear Deformation Theory”, International Journal of Emerging Technology and Advanced Engineering, Vol. 3, No. 1, pp. 369-374, 2013. Yang, Y. and Lim, C.W., “Wave Propagation In Double-Walled Carbon Nanotubes On A Novel Analytically Nonlocal Timoshenko-Beam Model”, Journal of Sound and Vibration, Vol. 8, No. 330, pp. 1704-1717, 2011. Ke, L.L. and Wang, Y.S., “Flow-Induced Vibration And Instability Of Embedded Double-Walled Carbon Nanotubes Based On A Modified Couple Stress Theory”, Physica E: Low-dimensional Systems and Nanostructures, Vol. 5, No. 43, pp. 1031-1039, 2011. Wang, L., “Wave Propagation Of Fluid-Conveying Single-Walled Carbon Nanotubes Via Gradient Elasticity Theory”, Computational Materials Science, Vol. 49, No. 4, pp. 761-766, 2010. Yang, F. Chong, A.C.M. Lam, D.C.C. and Tong, P., “Couple Stress Based Strain Gradient Theory For Elasticity”, International Journal of Solids and Structures, Vol. 39, No. 10, pp 235-243, 2002. Ke, L.L. Wang, Y.S. Yang, J. and Kitipornchai, S.,“Free Vibration Of Size-Dependent Mindlin Microplates Based On The Modified Couple Stress Theory”, Journal of Sound and Vibration, Vol. 333, No. 1, pp. 94-106, 2012. Aksencer, T. and Aydogdu, M., “Levy Type Solution Method For Vibration And Buckling Of Nanoplates Using Nonlocal Elasticity Theory”, Physica E: Low-dimensional Systems and Nanostructures, Vol. 4, No. 43, pp. 954-959, 2011. Aghababaei, R. and Reddy, J., “Nonlocal Third-Order Shear Deformation Plate Theory With Application To Bending And Vibration Of Plates”, Journal of Sound and Vibration, Vol. 1, No. 326, pp. 277-289, 2009. Natarajan, S. Chakraborty, S. Thangavel, M. Bordas, S. and Rabczuk, T.,“Size-Dependent Free Flexural Vibration Behavior Of Functionally Graded Nanoplates”, Computational Materials Science, Vol. 65, No. 30, pp. 74-80, 2012. Hosseini-Hashemi, Sh. Zare, M. and Nazemnezhad, R., “An Exact Analytical Approach For Free Vibration Of Mindlin Rectangular Nano-Plates Via Nonlocal Elasticity”, Composite Structures, Vol. 100, No. 2, pp. 290-299, 2013. Zhang, P.Q. Lee, H.P. Wang, C.M. and Reddy, J.N., “Non-Local Elastic Plate Theories,” Proceedings of the Royal Society A, Vol. 463, No. 2088, pp. 32–40, 2007. Hosseini-Hashemi, Sh. Rokni Damavandi Taher, H. Akhavan, H. and Omidi, M., "Free Vibration Of Functionally Graded Rectangular Plates Using First-Order Shear Deformation Plate Theory". Applied Mathematical Modelling, Vol. 34, No 5, pp 1276-1291, 2010. Khorshidi, K. and Fallah, A., “Buckling Analysis Of Functionally Graded Rectangular Nano-Plate Based On Nonlocal Exponential Shear Deformation Theory“. International Journal of Mechanical Sciences, Vol. 113, pp. 94-104, 2016. Khorshidi, K. Asgari, T. and Fallah, A. “Free Vibrations Analysis Of Functionally Graded Rectangular Na-Noplates Based On Nonlocal Exponential Shear Deformation Theory“. Mechanics of Advanced Composite Structures‎, 2016. Kim, Y.W., “Temperature Dependent Vibration Anaylsis Of Functionallygradedrectangular Plates”, journal of sound and vibration, Vol. 284, No. 3-5, pp.531-549, 2005. Li, Q. Iu, V.P. and Kou, K.P., “Three-Dimensional Vibration Analysis Of Functionally Graded Material In Thermal Environment”, journal of sound and vibration, Vol. 324, No. 3-5, pp.733-750, 2009. Natarajan, S. Chakraborty, S. Thangavel, M. Bordas, S. and Rabczuk, T., “Size Dependent Free Flexural Vibration Behavior Of Functionally Graded Nanoplates”, Computational Materials Science, Vol. 65, pp. 74–80, 2012. Shen, S.H, “Functionally Graded Materials Nonlinear Analysis Of Plates And Shells“, CRC Press Taylor Francis Group, 2009. Thai, H.T. and Choi, D.H., “Size-Dependent Functionally Graded Kirchhoff And Mindlin Plate Models Based On A Modified Couple Stress Theory”, Composite Structures, Vol.95, pp. 142-153, 2013. Eringen, A.C. and Edelen, D., “On Nonlocal Elasticity. 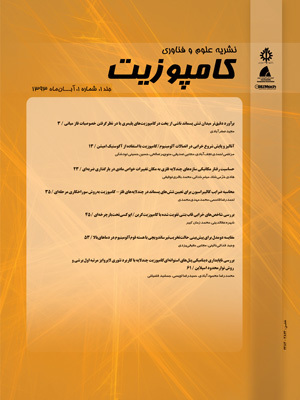 International Journal Of Engineering Science”, Vol. 10, No. 3, pp. 233-248, 1972. Shahrjerdi, A. Mustapha, F. Bayat, M. and Majid, D. L. A., “Free Vibration Analysis Of Solar Functionally Graded Plates With Temperature-Dependent Material Properties Using Second Order Shear Deformation Theory”, Journal of Mechanical Science and Technology, Vol. 25, No. 9, pp. 2195-2209, 2011.